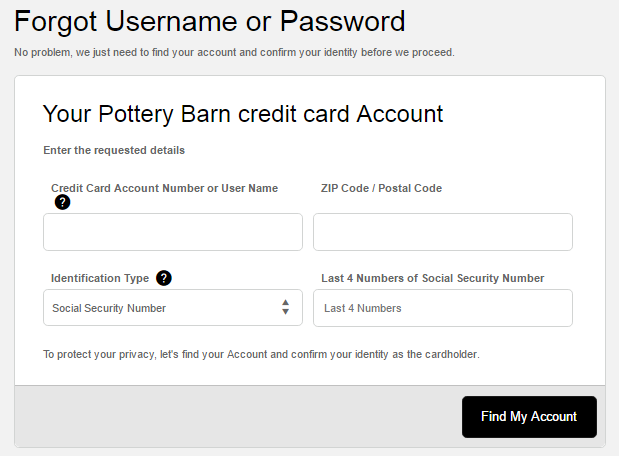 Pottery Barn Credit Card provides its customers with a secure online platform through which they can manage their account, make a payment and more. The credit card login is powered by the Comenity Bank. Using the credit card for making purchases you can earn a 10% back in rewards. One can also opt for special financing offers for 12 months. Logging into your account you can view earned rewards, make payments, pay credit card bills, earn and redeem rewards at Pottery barn, Pottery Barn Kids, or PBteen. The web portal developed by the Comenity Bank is extremely user-friendly and can be accessed via any web-enabled device. Read on to find a detailed guideline to the login procedure. Step 1– To log into your account you need to visit the login homepage. At the top left of the webpage, you will find the sign in section. Step 2– Provide your User Name and Password in the white boxes and click on the “Sign in” button below. 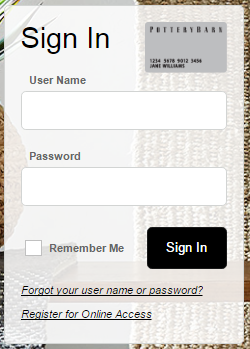 Step 1– Users who have lost their login credentials must go to the login page of the Pottery Barn and click on the “Forgot your username or password?” link located at the bottom of the sign in section. (For direct access to the password reset page, click here Link). Step 3– Click on the “Find my Account” button and you will be allowed to select new login credentials. Step 2– Set login credentials, select whether you wish to enroll in paperless and you are ready to go.